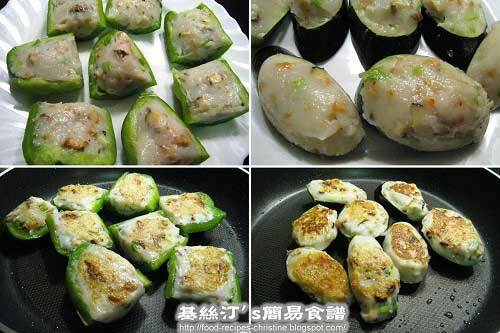 I was craving a popular dim sum in Hong Kong few weeks ago, called “Stuffed beancurd, eggplant and capsicum” (煎釀三寶). It’s a shame that I used up tofu and made only two of them. You might have tried or seen this popular dim sim offered in Hong Kong restaurants. No matter how cheap or luxury the yum cha restaurant you go, this dish would possibly be on their menu. The stuffed capsicums are the most popular one, I think, as the sweetness of just cooked capsicums are blended so well with the black bean garlic sauce. As for myself, I love all vegetables that are stuffed with meat, then cooked in sauce with rich flavour. It tastes heavenly. Rinse and soak dried mushrooms in hot water until softened and chop into dices. Reserve the soaking water to cook with capsicum and eggplant. Soak dried shrimps until softened. Rinse and drain well. Chop finely. Heat a bit of oil in a frypan to sauté mushroom and shrimp until aromatic. Set aside. Separate fish meat from skin and bones. Cut fish meat into chunks and mince the fish in a food processor. If you do not have a food processor, just chop them with your cleaver. Transfer minced fish into a large bowl. Add marinade and stir in, mushroom, shrimp and spring onion, toward one direction only, either clockwise or anticlockwise because you want to produce some fish paste with springy texture. Until you feel really hard to stir, uour fish paste is ready then. Rinse capsicum and wipe dry. Deseed and cut into squares, about 4 cm (1 1/2 inches) in length. Cut eggplant into slices about 2cm in thickness. Soak into salted water for 10 minutes. I find this method can help eggplant retain its fresh purple colour. Otherwise they would quickly turn black in colour once they are cut open and cooked. Drain well and wipe dry with kitchen papers. 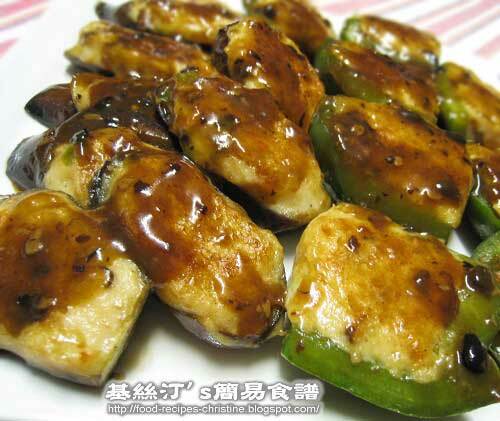 Sprinkle cornflour inside capsicum chunks and onto eggplant slices. Use a knife to stuff fish paste into/onto the vegetables. Heat oil in a non-stick frypan. Place the side with fish meat on pan and fry over medium heat in batches if needed. Set aside. Add oil in frypan and sauté black bean garlic sauce until aromatic. Pour in chicken stock (and mushroom soaking water). Bring to a boil. Add eggplants first and cook for a while, then followed by capsicum because eggplants need longer cooking time. If sauce dries up too quickly, replenish water if necessary. The amount of water you add depends on how high the power of your stove. The basic idea is to get all ingredients cooked through. The final step is to add thickening and cook the consistency to your preference. Dish up and serve hot. Thanks so much for letting me know you love my blog! I agree. I absolutely love your recipes! They're delicious and easy to make! I've cooked almost everything on your website!! Please post up more of your mouth-drooling dishes :) with pictures too! I find it really helpful when there are pictures in a step-to-step process. This looks unique to me and SUPER yummy! Yeah, I know. It's quite new to my friends in US too. Well, it's a popular HK snack. How do I know the fish paste has been cooked thoroughly? My filling turned out to be very mushy (like mashed potatoes) rather than springy. Is it because it's undercooked? Or should I try a different fish? I cooked it covered for around 8 minutes. Fish paste doesn't need very long time to get cooked. Suppose you had very fresh fish. If you follow the instructions of this recipe, it shouldn't be any problem. 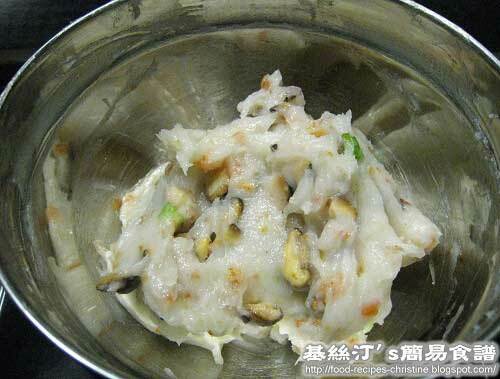 Please bear in mind that some fish flesh is quite mushy in nature, not suitable for making fish paste. Can we steam the eggplants instead of frying? Guess that it'll work, although I haven't tried steaming. What you need is not to steam too long. Or else the eggplant will be too soft and mushy.